"Even Achilles had his heel issues, and both these squads are struggling on defense this term"
The term blockbuster is grossly overused. Particularly when it comes to The Fast and the Furious franchise. However, after a few lacklustre Monday Night match-ups between the also rans of the NFL, we finally have one which truly pits the two leading actors against one another in what could even prove a Super Bowl precursor. After all, as open as this year's campaign admittedly feels, the Los Angeles Rams and the Kansas City Chiefs are both 9-1 for the season and respectively hold the number-one seedings in the NFC and the AFC: the gateway to homefield advantage throughout the play-offs. Accordingly, MNF has gone from rusting up on blocks to busting them, with an evening of high octane, adrenaline-pumping action surely in store. Don't just take my word for it, defer to the venerated Vegas line instead, which has already seen the Total Points quote on this game move to a staggering 63 points, the tallest total for a league game since at least 1986. If it's being billed as The Fast and the Furious, all the spare parts are in place. And since we're feeling the speed, we should feel the rush of running men Todd Gurley for the Rams and Kareem Hunt for the Chiefs. Gurley, whom we tipped at the season's outset to again top the league's running charts at 4-1, presently leads the way again with 988 yards, but Hunt isn't lagging far behind in stats with 754 yards. Both these stud running backs pose a twin threat, however, since they are both developing into increasingly useful receiving outlets with a pair of pouching paws only marginally less receptive than their rear gunners. Gurley has the pure pace and stamina. Hunt has the power and physicality. It should be quite the shootout. Of course, to focus on one key head-to-head match-up is to foolishly overlook another. 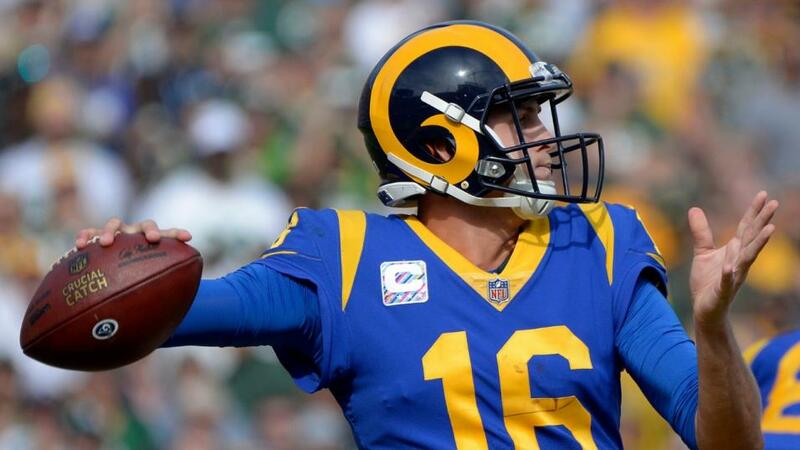 Quarterbacks invariably pull the strings of an effective offense in the NFL, and there are no brakes on the juggernauts that Jared Goff and Patrick Mahomes drive. Indeed, one of these two QB youngsters will assuredly take over as the top starter under center in the league for Total Passing Pards after tonight's tussle. Just consider the company they're keeping in that key stat: Matt Ryan, Ben Roethlisberger, Aaron Rodgers and Drew Brees comprise the other members of the top six. It's an elite echelon and these two sluggers are there on merit, even if they are ably abetted by perhaps the two strongest man-for-man rosters in the NFL. In fact, only New Orleans can hold a candle to these LA and Kansas offenses. Even Achilles had his heel issues, though, and both these squads are somewhat struggling on defense this term. That's surprising from the Rams, who boast a bulwark line, and I'd expect them to make a stand here at home. You may not be able to stop Mahomes and Hunt, but you can certainly slow them by bringing some heat to Mahomes, who is still to be tested in the cauldron of battle - remember, he ultimately came up short against the receding powers of Tom Brady in October. Goff and Gurley can do the rest. Especially since their D is demonstrably better than Kansas City's at a respectable 12th in the NFL, coughing up an acceptable 23 points per game in another telling statistical category. Seeing as the handicap is only around a field goal here, I'm happy to get with the Rams across a few lines. Nay-sayers will retort that the Chiefs are 8-2 against the spread (ATS) and rank an impressive 5-0 ATS on the road. Even the Green Bay Packers nearly turned LA over here. In fact, ultimately, the Rams' main stumbling block could be their own ground of the Memorial Coliseum, whose size and poor attendance-levels appear to deliver one of the worst homefield 'advantages' in the league. Or, as Rams owner Stan Kroenke put it, "the Coliseum is cavernous. It swallows of 65,000 people." That said, attendances have certainly swelled since the Rams showed themselves to be legit contenders last year. And if the home faithful can't get up for this humdinger, they don't deserve a team of such towering talents. So leave this to the savvier Goff (22 touchdowns for six interceptions this season) to show Mahomes the way. Caution may be the better part of valour, however. And with so much at stake and two stud rushers in the backfield, the clock should unravel quickly. So I'll also take the contrarian's view by playing the under on Total Points and hoping the scoreboard doesn't glow white-hot. In other news, we've had a couple of decent results on first touchdown scorer over the past few weeks, and my inclination is now to shut down trading on that notoriously fickle market down for the season, popular prop play though it is. But if you do want an interest, don't look far beyond the obvious in Gurley, even if he's hardly the world's best-kept secret. With Cooper Kupp MIA, the 24-year-old will see even more action tonight and can show he's still the blockbuster star of this league. To state the obvious: it will be fast and furious. If you're staying up late, enjoy.